We are pleased to bring the Boonex Dolphin Community dAMP. 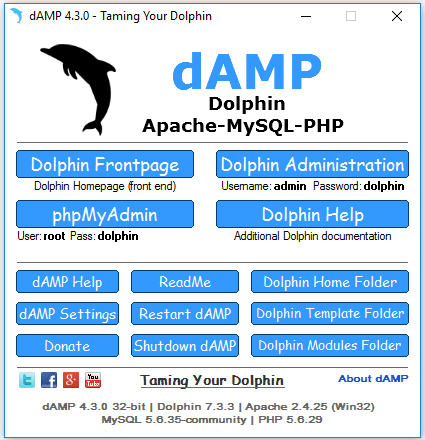 dAMP is short for - Dolphin Apache MySql PHP. 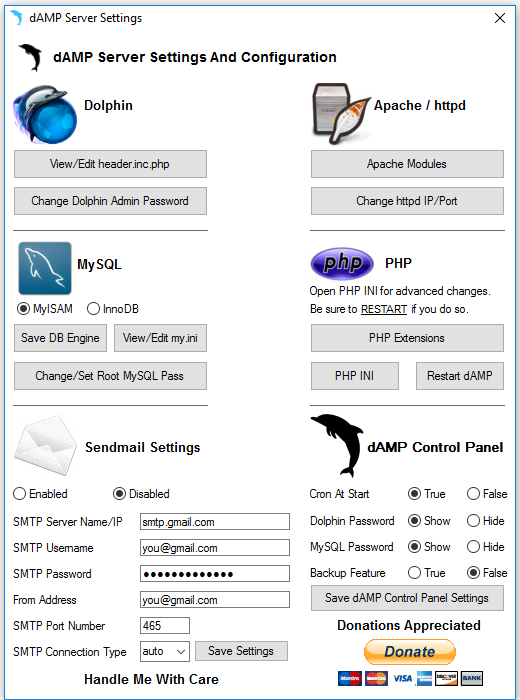 dAMP is a FREE custom WAMP (Windows - Apache - MySql - PHP) server stack designed specifically for Boonex Dolphin. It comes with Dolphin pre-installed including the database. It is also pre-configured and optimized specifically for Dolphin. It has a friendly built in Windows based cron feature with automatic (default) or manual start. It is compatible with Windows Vista and newer computers. Works on both 32 and 64 bit systems. It has been designed so you can start using Dolphin fast on your local PC. New users will definitely appreciate how easy it is to get started. It is possible to begin using Dolphin in a matter of minutes with dAMP. All you need to do is download the .zip. Extracted it, start dAMP and enjoy! To test a feature, module, or other modification before applying it to a live site. To test edit .css, .html, .php, and other file types before making changes to a live site. To design and develop Dolphin websites before publishing them to a live site. To learn phpMyAdmin and database maintenance. To test-drive the features before purchasing a paid license or hosting. At this time we will be providing a single 32 bit version that will run on both 32 bit and 64 bit Windows systems. We had been maintaining 32 and 64 bit versions, along with an older Dolphin and a newer version, as well as an NginX version. This was just way too time-consuming to maintain so many different versions. A single 32 bit version will be much easier to update and maintain going forward. It is currently built and compiled with Microsoft Visual C++ 2012 (AKA VC11). You will need Visual C++ 2012 libraries installed on your computer. If you have a newer PC most likely you already have them. If not you can download and install them directly from Microsoft with the link provided below. - A PC with Windows Vista or newer. Both 32 bit and 64 bit systems are supported. - A minimum 245 MB's of free hard drive space for files (Allow additional free space for testing). - The majority of the space used/required is consumed by Apache, MySql, PHP, and phpMyAdmin. dAMP is a portable app, which means it will run from any folder/location on your computer. Even an external flash drive. Download sizes and free hard drive space requirements will change slightly when Apache, MySQL, PHP, phpMyAdmin, and Dolphin related files are updated. Download size and hard drive space requirements should be considered an approximate estimate. &xrarr;And More ... Options Available when clicking certain buttons!